Nick Natario is an ABC13 multi-media journalist. Nick comes to Houston after working in four other cities across the country. 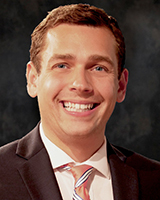 Nick started his career in Elmira, New York, and most recently spent two years at WISH-TV in Indianapolis, Indiana. During Nick's career, he followed Mike Pence on his rise to Washington D.C., from being added to the ticket in New York City, vice presidential debate in Virginia, and Election Night in New York City. Nick also covered historic flooding in South Carolina in 2015. Nick takes pride in being a multi-media journalist. His work earned him a New York State Associated Press award, and three regional Emmy nominations for best multi-media journalist. In Nick's spare time he enjoys to run. He's tackled several 5K, 10K and a half marathon race. One thing he's looking forward to in H-Town is embracing its sports teams. Being a Massachusetts native, Nick is a diehard Red Sox, Celtics, and Bruins fan, but he's looking forward to cheering on Houston's professional teams. His passion for sports isn't only tied to professional teams. Nick bleeds orange. As a Syracuse University graduate, he can't get enough of his Orange teams. The newly released video shows a silver Honda Accord or Civic used in the shooting death of a pizza delivery man. A student claimed he was forced to roll around in human waste, drink scalding beer and suffered a lacerated spleen. In October, BBVA Compass told her someone removed money from her account four times, totaling more than $5,000. A Houston woman said getting to know her delivery driver saved her from falling victim in an identity theft case.